TEHRAN — the presence of a prominent American scholar on Iranian university campuses this week, and the wide and positive reception he is receiving, is a sign that authorities here are attempting to fulfill promises of more openness in academia. 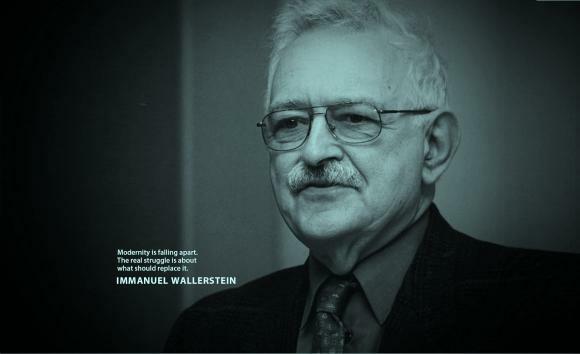 On Sunday, Tehran University’s School of Social Sciences hosted an event discussing the theory and work of Immanuel Wallerstein, a well-known critic of capitalism, best known for his world-systems analysis and his views about the decline of major powers, including the United States. “I’m not sure what attracts people to my work. Maybe it’s that I’m an American, I say things that Americans don’t usually say and I have an analysis which seems to resonate in a lot of countries,” the 84-year-old Wallerstein said in an interview Monday. Hundreds of students and professors crammed into the campus’ largest auditorium to hear Wallerstein’s remarks, which were preceded by discussions of his work by top Iranian sociologists, almost all of them delivered in English, a rarity in Iran. “No government or social movement can be taken seriously if it is not addressing the issues of today,” Wallerstein told the audience toward the end of his hour-long speech, which at times dealt with topics that are often considered taboo in the Islamic republic, including women’s rights and corruption. Wallerstein also spoke at Iran's Centre for Strategic Studies, a think tank co-founded by Iran’s president, Hassan Rouhani. “Most of the Rouhani team probably agrees with Wallerstein on his geopolitical views and the double standards in international relations when it comes to Iran," said Princeton University sociologist Kevan Harris, who helped coordinate Wallerstein’s visit. Although U.S. scholars have occasionally appeared at Iranian universities in recent years, such a highly publicized and open forum was unimaginable since the uprisings that followed 2009’s contested reelection of Mahmoud Ahmadinejad. Wallerstein’s explanation for the persistence of global inequality resonates with thinkers in many third world countries and is perhaps why Iranian intellectuals have embraced his ideas for so long. “He's been well-known in Iran since the 1970s. Many of the 1979 revolutionaries were reading his books, but so were their domestic adversaries,” Harris said. Local media lauded Wallerstein’s visit, with the reformist daily, Shargh, putting the American scholar on its front page Sunday. “I’m surprised at the depth of the reception. It’s very strong here,” Wallerstein said. Wallerstein noted, however, that some liberal-minded Iranian scholars who attended his talks told him that his views are dangerous because conservatives here often use his argument about a declining U.S. to justify not liberalizing, but such readings missed his point. “I can’t control how people interpret me. I’m saying the U.S. is in decline and is weaker than it thinks, but I’m also saying Iran is weaker than it thinks, and everyone has to get realistic about how much power they really have in the world,” Wallerstein said. سلام نماز و روزتون قبول. خیلی وقته دنبال این سند بودم که متاسفانه پیداش نکرده بودم. خدا پاداشی نیکو در هر دو دنیا به شما بدهد. با تشکر. التماس دعا.